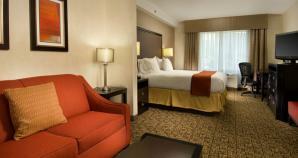 We invite you to a modern and affordable stay in the heart of Alexandria. Find us less than 2 miles from shopping and dining in historic Old Town and only a short drive to Mt. Vernon, Washington DC and George Washington University. Military guests will find Fort Belvoir, Bolling Air Force Base and the new BRAC offices nearby. We deliver exceptional value to business travelers, families and social groups. Amenities include: free Express Start® hot breakfast daily, free shuttle to the Huntington Metro, free high-speed Internet, 24-hour fitness and business centers, flexible event space with catering and planning assistance, and an on-site gift shop. Our 100% non-smoking guest rooms and two-room suites come equipped with free Internet, LCD HD televisions & HD programming, and in our suites only: a microwave, refrigerator and wet bar. We offer DISCOUNT ROOM BLOCKS for reunions, weddings and tour groups, and with 86 spacious rooms and suites, we can easily accommodate your whole group. Additional Metro Info: Shuttle service is available Monday-Friday, 7:00 a.m. - 10:00 p.m.; Saturday-Sunday, 8:00 a.m. - 8:00 p.m. To request pick up or drop off at the Metro, please contact the front desk at 571-257-9555.